Partly to mostly cloudy. High near 80F. Winds S at 10 to 20 mph..
Thunderstorms - a few could contain very heavy rain, especially overnight. Storms may contain strong gusty winds. Low 61F. Winds S at 10 to 20 mph. Chance of rain 100%. Rainfall may reach one inch. About a year ago the fate of Hutcheson hospital seemed dire. After serving the tri-county area for more than six decades, the hospital — were it human — was under hospice care. But the hospital was given a new lease on life. It was renamed Cornerstone Medical Center when ApolloMD, the medical services provider that was operating Hutcheson's emergency room, bought the troubled hospital and its assets in a sale overseen by federal bankruptcy court. It might seem there is little to show following ApolloMD's purchase, but outward appearances can, and often are, deceiving. If based solely on a cursory glance when driving past the 68-year-old facility it does seem empty. Its parking lot's three levels are far from full and lines of florists' delivery vans are absent outside the main entrance. Walking past Civil War-era cannons and into the lobby reveals gleaming terrazzo-floored hallways, windows that sparkle and clusters of comfortable chairs. What is lacking are signs of activity — the quiet is deafening. But step inside the Emergency Room portal and things are different. "An ER is first and foremost what this community needs," Cornerstone CEO Jessica Long said during a tour of the Fort Oglethorpe facility. While it might seem the hospital's resurrection is moving at a glacial pace, it is worth noting that Cornerstone could not just put out an "under new management" sign and begin functioning as an accredited hospital. Instead, just as it would be required of any new hospital to obtain certification from licensing boards and the ability to bill public and private insurance companies for services provided. All necessary credentials are in place and Cornerstone soon will be able expand its offerings. But even as crucial paperwork was making its way through bureaucratic channels, the hospital staff and administration has not been idle. "We are focusing on finding a fit for Cornerstone into the overall health care services in this community," Long said. "ApolloMD has been really good about efficiently operating as a hospital and serving our doctors as well as our patients. Everything we do is meant to make it easier for everyone in the community to get what they need." Helping make access to available services includes introducing technology that allows direct interaction with the staff. Last month, Cornerstone launched ER Express, an online reservation system for the Emergency Department. Using ER Express, patients with non-life-threatening illness can now reserve a time online to be treated in the Emergency Department. Describing the ER as "the front door to our hospital," Long said the use of state-of-the-art technology "allows us to better serve the community and optimize our core services." Rather than someone coming to the hospital, signing in and then sitting in a waiting room — and minutes can seem like hours, and hours like days if you're sick — the online system allows patients to remotely check-in and select an available reservation time. "People appreciate the ability to sit at home rather than in an ER waiting room," Long said. Once the reservation form is completed, patients remain in the comfort of their home until their designated ER Express time. A similar service, ER Passport, lets physicians make online referrals to the ER for emergency care. The physician can notify the ER in advance so the hospital staff are prepared for a patient arriving for treatment or for tests. "This is a unique and different way to offer services," Long said. "The beautiful thing is it helps nursing staff schedule time and manage volume." 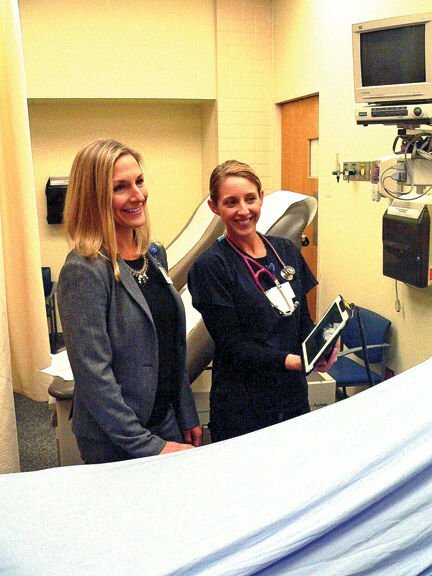 In addition to the online check-in services, Cornerstone has also partnered with ER Express and Bioscape Digital to place patient experience tablets in each patient room in the Emergency Department. 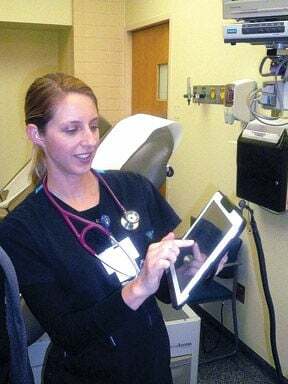 These tablets provide patients and family members opportunities to view educational videos and after care instructions, as well as interact with their clinical teams. As an added bonus, the hospital's ER has extended hours for out-patient services that physicians might order. While still operating more as an ER until it can add a full complement of clinical services, Long said the hospital's mission has remained constant. "At the end of the day, our goal is to assure quality of care," she said. Hutcheson Medical Center in Fort Oglethorpe, which federal bankruptcy court ordered closed on Dec. 4, 2015, re-opened for patient services within weeks, on Dec. 22, under a management services agreement with ApolloMD. The hospital was renamed Cornerstone Medical Center in the spring of 2016. Mike O'Neal is assistant editor for the Walker County Messenger in LaFayette, Ga. He can be reached at the Messenger office at 706-638-1859 and by email at moneal@npco.com.